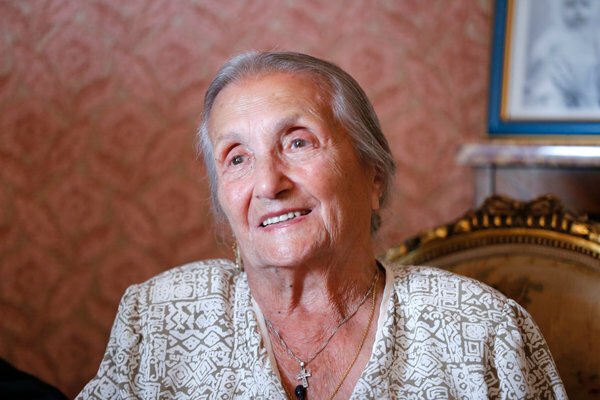 Rosa Bouglione in her apartment in Paris in 2014. Married in a lion’s den, she became the doyenne of the Cirque d’Hiver in Paris. Rosa Van Been married behind bars when she was 17. She had chosen the venue voluntarily, and was unfazed that her hirsute guests were more likely to snarl at the happy couple than smile approvingly. After all, Rosa had been performing her signature serpentine dance inside the lions’ cage since she was a teenager. Moreover, her fiancé, Joseph Bouglione, an animal trainer, was also confident that the guests wouldn’t gnaw on the happy couple. 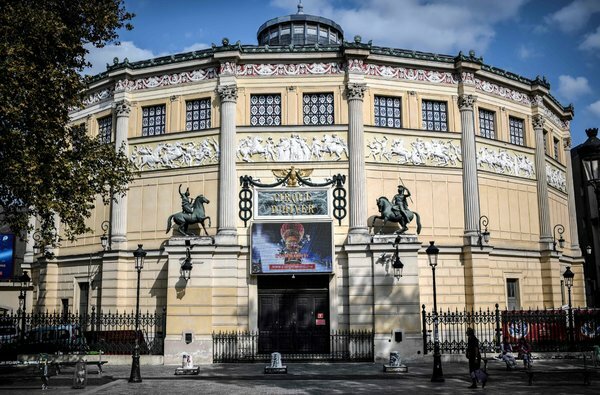 Nine decades later, Rosa Bouglione, the matriarch of the family that still operates the circus, died on Aug. 26 in her home in that city, just around the corner from the Cirque d’Hiver’s circular 2,000-seat arena, which was commissioned by Napoleon III. She was 107. 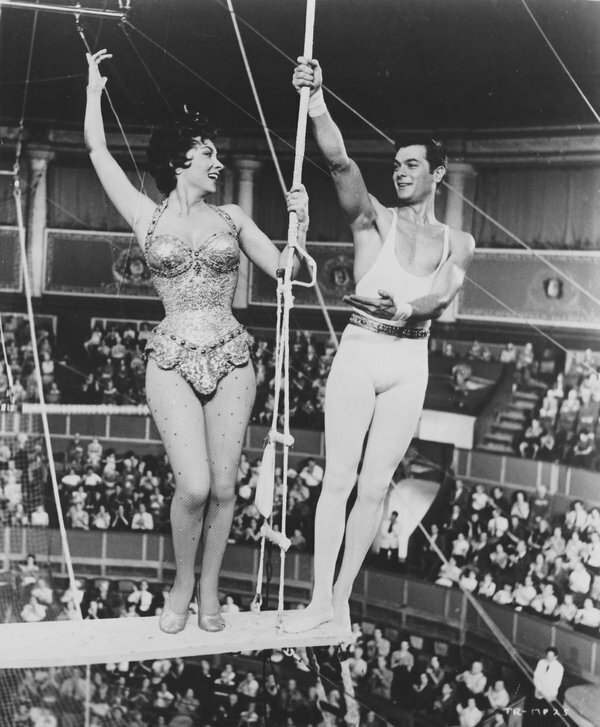 Gina Lollobrigida and Tony Curtis in the 1956 movie “Trapeze,” directed by Carol Reed and filmed at the Cirque d’Hiver. Madame Rosa, as she was known to millions of circus lovers for generations, was born into a traveling Roma, or Gypsy, circus family and never outgrew the wonderment at the big top that beguiles children of all ages. Among her pets was a foulmouthed parrot, Coco, who lived to 45 and was fluent in French obscenities. She memorialized her dead pet leopard Mickey by converting him into a dining-room table throw, gnashing teeth included. She smuggled a baby gorilla into a hotel in a hat box and roomed with him for a month. Cases of Perrier water had to be stocked for Jackie, another great ape, who refused to drink anything else. Along with the acrobats, contortionists, jugglers and animal acts, guest celebrities also appeared with the circus at its famed arena and sometimes in shows under the Eiffel Tower. Among them were Josephine Baker, Ingrid Bergman, Maurice Chevalier, Marlene Dietrich, Rita Hayworth and Jerry Lewis. Maria Callas was nearly stomped by an elephant who was said to become agitated when Joseph Bouglione was around women other than his wife. Rosalie Van Been was born on Dec. 21, 1910, in Ixelles, Belgium, a suburb of Brussels, in a horse-drawn circus caravan. Her father, Jules, was an animal trainer. Her mother was Gina Penetenti. “I was born in a caravan, and that’s where I left my heart,” Ms. Bouglione said in her autobiography, “A Wedding in the Lions’ Cage: The Great Saga of the Bouglione Circus” (2011), which she wrote with Patrick Hourdequin. 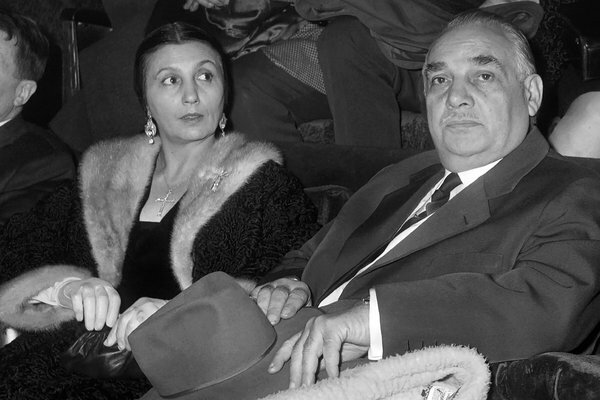 Ms. Bouglione and her husband, Joseph, in 1963. She began performing with a circus called Ménagerie Van Been Frères at 14, interpreting a Serbian dance choreographed by the American actress and dancer Loie Fuller. (It included a pride of prowling lions directed by her father.) She also introduced an act that starred a Siberian white wolf, with a supporting troupe of dogs. She married Joseph Bouglione in 1928. He was a third-generation lion tamer who with his father and three brothers had been performing in a version of Buffalo Bill’s Wild West Show. They had seven children. Joseph Bouglione died in 1987. The family said that Ms. Bouglione is survived by a total of 55 children, grandchildren, great-grandchildren and great-great-grandchildren. The Bougliones began touring with the Cirque d’Hiver in 1935 after rescuing it from bankruptcy the year before. During World War II, with the couple’s Romany roots concealed behind the Bouglione family’s Italian-sounding name, the company was permitted to operate despite the Nazi occupation. The couple protected Jewish performers and secreted weapons for the French Resistance. As the years went on, Ms. Bouglione moved from performing in the circus to managing it. The September 1955 issue of Harper’s Bazaar included a photograph by Richard Avedon of the fashion model Dovima at the circus flanked by two elephants. A print is in the collection of the Victoria and Albert Museum in London. Burt Lancaster, Tony Curtis and Gina Lollobrigida filmed Carol Reed’s 1956 love-triangle movie “Trapeze” at the Cirque d’Hiver (where the flying trapeze was said to have been introduced). That was when Joseph Bouglione told Lancaster that he could “practically guarantee” his safety during a scene with a tamed lion, according to an account in The New York Times. The Cirque d’Hiver building in Paris. The Bouglione family has owned the Cirque d’Hiver since 1934. A panther freed himself in the cargo hold on a flight from Saigon to Paris. A herd of elephants escaped while the circus was on tour. A dozen elephants almost had to be jettisoned from a Noah’s Ark boatload of animals to keep it from sinking in a freakish storm on the way to Latin America. Ms. Bouglione never lost her love of the circus, even as she matured into the family’s doyenne. Her concessions to growing older were to move closer to the circus in 1984 and to attend matinees instead of evening performances. But she remained as candid as ever in communicating her opinions to the performers. Still, Rosa Bouglione remained hopeful that the show would endure forever.